Nikki Robertson and Elissa Maelspina made my Saturday with the Gmail arrival of my acceptance letter to be a presenter at the ISTE Librarians Network Digital Playground in June. "Did a happy dance around my kitchen!" I've been a huge fan of the playgrounds at ISTE since my first trip in 2009 to Washington D.C when ISTE was known as NECC. Meeting in person, my virtual librarian friends Gwyneth Jones, Lisa Perez (Chicago Public School District Library Manager) , and Joyce Valenza just changed my whole outlook on my librarian career. Gwyneth and I entertained a whole conference room with our jumping up and down squealing when we finally caught up with other. 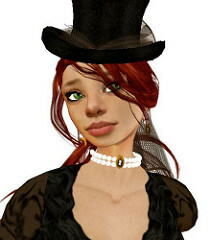 Yes, we were two of those virtual librarians in Second Life together - so fashionable in our Victorian Steampunk outfits and hats. Lisa quietly recruited me to work with the playground the next year as a greeter while Gwyneth had me designing the Second Life Virtual version of the Librarians Playground. For 2011 I was on the Google team for the librarian's playground which really gave me the opportunity to share with teachers from all over the world. That Google baseball card template lesson is still floating around the world. You can find that lesson and my other presentations from past ISTE playgrounds here. 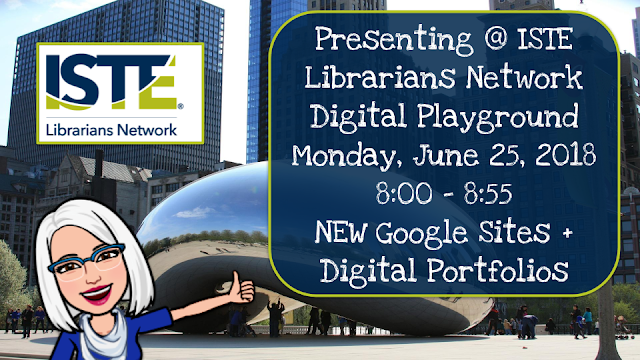 In just a few hours at a playground visit, you can learn first hand ideas and resources to take back to your libraries and classrooms from the librarians who are on the front lines learning and sharing the best of the best new ideas. If you are heading to Chicago in June, make time in your planner for visiting the playgrounds, especially the Librarians Network Digital Playground. Check off the groups that appeal to you and your learning goals. Visiting a playground is a great way to break up busy day of sessions. Make plans for next year to volunteer with your favorite playground network - you will love presenting to a great crowd of learners.